Get Kapahi Real Estate Listings Before Your Competition! 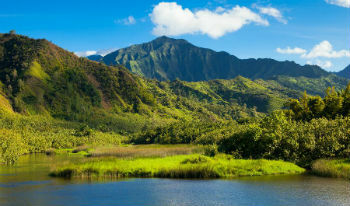 Kapahi real estate offers residents some of the most alluring mountain views on the entire island of Kauai. Nestled at the foothills of the Makaleha Mountains, the Kealia Forest Reserve and near Kapaa, homes for sale in Kapahi are well-crafted and ingeniously designed to take advantage of the exquisite views. With natural Hawaiian finishes and lush greenery, these homes emphasize the true tropical ambience that many buyers are looking for. Buyers seeking a home that will accentuate Kauai’s natural habitat will fall in love with Kapahi homes for sale. Many of these properties are complete with Bamboo or beech wood flooring, massive windows, and botanical gardens, guaranteeing a tropical and private retreat. Additionally, the expansive lanais and gorgeous pools are perfect additions to help residents enjoy the valley and mountain views. The homes for sale in Kapahi offer gourmet kitchens and state-of-the-art appliances, making these properties a chef’s dream. It’s not hard to fall in love with cooking on this island with the culinary delights that Kauai has to offer. The beautiful community of Kapahi is only 4 miles to the bustling Kapaa, down the road from Wailua Homesteads, less than 25 minutes to Lihue airport and just over 4 miles to the gorgeous Kealia Beach. This exquisite community provides buyers with the cloistered home they’ve been searching for, while still neighboring popular restaurants, shops and beaches. And the community’s spectacular mountain views are difficult to resist. You’ll be in good company with a Kapahi home. Kapahi is ideal for families and buyers searching for a private escape with plenty of room to run around. With exquisite mountain views, homes for sale in Kapahi are rural and idyllic. You don't need to worry about a timeline when you live here - you're on island time. Parents will be pleased to know that Kapaa Middle School and Kapaa High School are two of the top schools on the entire island, promising a top-notch education. If you’d like more information on Kapahi real estate, send Anne a message online or call her at 808-855-5808.